There are those whose footsteps we would not want to follow, whose shoes we would not want to be in – yet we strive to have their character, their strength, their drive and their courage. It is from them we learn that the worst of humanity can bring out the best in humanity. Yusra Mardini used to be a typical teenager. She would chew the fat with friends, smartphone in hand, laughing. The middle of three daughters, she lived at home with her parents, attended a gymnastics club and loved swimming – she could potentially become a great swimmer – yet it was an ordinary life, not the sort of existence journalists would travel far to write about. Then came Syria’s civil war, the callousness of conflict, with its bombs, its suffering, its death. Cheerful chatter was no longer normal and as the years passed – one becoming two, three turning into four – home morphed into hell as her country was torn apart. She was alive but not living. Her house came under fire, forcing the family to move. The roof of the swimming pool where she trained in the Syrian capital of Damascus was ripped open by bombs. She could see the water, but no longer be in it. It was torture. Mardini knew of footballers who had died in an attack. “I could not take it any more,” says the 18-year-old. This daughter of a swimming coach had two choices: exist in her homeland without hope, or escape for the freedom to dream. It is 12 August, 2015, four and a half years since the civil war began. It is the day Mardini and her eldest sister, Sarah, will leave Syria with their father’s two cousins and other refugees. They say farewell to their tearful parents and younger sister, who would follow their journey on GPS, and flee to Beirut, their first destination in what will become a 25-day slog. This group of refugees know what they must do: follow the path taken by over four million of their compatriots. No-one knows how many people have died in the war. The United Nations stopped collecting statistics in 2014 when the death toll was 250,000. More recent reports say the number is twice that – that 11.5% of the country’s population has been killed or injured, that life expectancy dropped from 70 in 2010 to 55.4 in 2015. How many people are still in Syria? In March, it was estimated that 17.9 million people still lived in Syria – down from 24.5 million before the war broke out. The United Nations says 13.5 million in Syria are in need of humanitarian assistance, with 4.5 million of those in hard-to-reach and besieged areas. One in four schools have been damaged or destroyed. There are a million fewer school-age children in the country than there were in 2010. Fears are heightened as they approach southern Turkey’s high peaks and deep valleys. They spend four nights in a jungle, the habitat of gunmen lying low. There is no food, no water, and their futures are in the hands of armed smugglers, one of whom, after disputes and threats, will take them across the Mediterranean in a flimsy dinghy to Greece – but only for a considerable amount of cash. The sisters are in deep water. Waves are crashing into them, the salty water burns their eyes. Every stroke is a struggle. Swimming will one day transform their lives, but now it must save them. It was 30 minutes into their journey to the island of Lesbos that the engine of their dinghy, carrying 20 people rather than the six or seven it was intended for, stopped. My sister didn’t want me to go in the water. We were drowning and arguing at the same time! Water oozed on to the boat, possessions were tossed overboard. Panic. The load needed to be lightened or the dinghy would capsize. “I thought it would be a real shame if I drowned in the sea because I am a swimmer,” says Mardini, who learned to swim when she was three. Few of the refugees could swim so first Sarah jumped in and Yusra, against her sister’s wishes, followed. For the next three and a half hours they and another young woman dragged the broken-down boat towards the shore, clinging to the rope dangling from the side. Thirty minutes from land they succumbed to exhaustion; they couldn’t swim any more. From this day on, Mardini will hate the open water. “Everyone was just grey on the way,” she remembers. “It was like my life was passing through my eyes. We put the rope around our hands because even I couldn’t swim in the sea with waves like that. Shivering, she fell to the ground when she stepped on dry land. Then she prayed. Surviving the sea was not the end. Mardini could no longer hear the shelling and the ground no longer rumbled – but she was not welcomed by everyone on this new continent. They think we lived in some desert. No, we had everything, like you. “When we got to Greece we saw a restaurant,” recalls Mardini. Mardini was hungry and thirsty. She had no shoes, just sodden jeans and a T-shirt. She had wrapped her passport, mobile phone and money in a waterproof bag and, somehow, they had also survived. “Eventually they let us buy water, and then some girl saw us, she gave me shoes and the little kid trousers,” she says. The refugees, who by now cared for each other like any family would, continued their 1,000-mile trek to their destination of choice: Germany. From Greece, they crossed through Macedonia, Serbia, Hungary and Austria – on foot, by train and bus – before arriving in Munich and then onwards to Berlin. They had survived. Twenty-five days after giving up on the life she had known, there was hope again. “I just know that my trip was over, and that I’m at peace with it,” she says. Mardini’s first German home would temporarily be a refugee camp, and one of her first questions in this unfamiliar city concerned finding the nearest swimming pool. An Egyptian translator put the sisters in touch with Wasserfreunde Spandau 04, one of Berlin’s oldest swimming clubs. “They saw our technique, saw it was good, they accepted us,” she says. It was of no great surprise that swimming coaches were impressed, particularly by Yusra, once a competitive swimmer supported by the Syrian Olympic Committee. After four weeks of training, Mardini’s coach, Sven Spannerkrebs, began making plans for the Tokyo Olympics in 2020 – but in March of this year the International Olympic Committee (IOC) announced there would be a team of refugees at this summer’s Games in Rio to send “a message of hope for all the refugees in our world”. In Berlin, of course, there was a teenager making rapid progress, an inspiration who had a real chance of making the team. But little did Mardini realise that her story would chime with the world. So numerous were the phone calls, so constant the questions and interview requests – from journalists in Japan, the United States, all around Europe – Spannerkrebs resorted to throwing his phone into a fridge on that March day when the IOC named Mardini on its shortlist of 43 refugees. Two months before the start of the Rio Olympics, Mardini receives an email from the IOC. Her mind races, her eyes widen: will it be a chance of a lifetime or a shattered dream? She clicks, she reads, and jumps up and down as if she were on a pogo stick. Exhilarated, she nearly cries. She will compete at the Olympic Games. 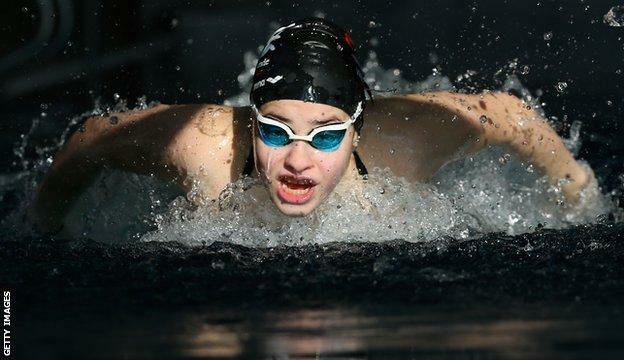 Supported by Germany’s elite sports school system, which allows her to train twice a day in an Olympic-standard pool near to her school (on a typical day she will wake at 6am and return home at 8pm), the accomplished swimmer has produced personal best after personal best. Her coach describes her as focused, her father – who now lives with Mardini in Berlin, along with the rest of the family – says his daughter is living his dream. The appeal of the pool is easy to understand. It is a place where the girl who one day wants to be a pilot can forget about the civil war and the friends she has left behind. Gliding through water, the past disappears.